My prayer at the beginning of 2013 was to become pregnant again. By March I became pregnant, however, when I went for my 12 week scan, the Stenographer told me the baby’s heartbeat had stopped and the baby died at 6 weeks. I had had a ‘missed miscarriage’. This didn’t make sense and I was devastated for a short time. However, earlier that morning, just before the scan, I had read in the word that Joshua didn’t win every battle, but he won the war and reached the promised land. I realised God was preparing my heart and telling me that although we don’t win every battle that I will have the final victory. There is a promise to be got in every trial…and I will get double for my trouble! But God is with us, this I know. Can you hear him calling us? For you see, there is no death in Him. Beneath the arms of my Beloved One. All I wanted to do was thank God that my baby was in heaven, in the best place and I would become pregnant again. Like Job in Job chapter 1, I am righteous in Christ and will have the ultimate victory-the enemy can throw stuff at me but I will never stop praising Jesus and I will get right back up and see God’s glory come in every situation! And like the last chapter in Job and in Isaiah 61, God said he will give me double for my trouble; therefore I can’t lose. Although I held onto these words, I still had my moments. I remember talking to Theo and saying I was frightened of becoming pregnant again, what if it happens again? And Theo said, “ What if it does happen again, but you are so at peace and strong in Jesus that nothing can shake you?” This gave me courage. ‘My heart and my flesh may fail but He is strength and my portion forever.’ (Psalm 73:26) During this time Theo wrote a song called Even in the Valley published on the Freedomcentre CD, the lyrics reflect how we hung onto God and found peace regardless of the circumstances. I chose to believe it will not happen again, but even if it did, like Daniel said to Nebuchadnezzar (Daniel 3:18), I will not stop worshipping Jesus, because I know he died for every calamity that comes my way and his heartbreaks with me when life is tough, but I am also bought by his precious blood and there are so many promises in his blood to have victory. After this conversation a couple from Iris Ministries prayed for me and prophesied that I would have 3 children. This gave me courage and I began to believe it wouldn’t happen again. Reading this I knew my baby was protected and it’s God’s heart to bring life into this world not death and I must stand on this promise. God also gave me a picture during worship one Sunday morning, I could see my baby in embryo form surrounded by what I can only describe as an orb of protection. This same picture came back to me later on. When I went for my 12 week scan I was a little nervous but I held onto the words God had given me. Praise God all was well and I was surprised to discover that I was 17 weeks pregnant not 12! The stenographer could also tell at this stage that we were having another boy. A few weeks went by and I started to bleed again, but I just kept praying and holding onto the words God had given, but one night I began to bleed heavily and I had to be rushed to hospital in an ambulance as I had had a minor haemorrhage. Theo and I prayed before the ambulance arrived and covered our baby in the blood of Jesus and commanded the enemy to leave him alone. This I believe was a very significant prayer that set us up for the long journey ahead. At the hospital the doctors did a test which indicated whether labour is imminent or not and turned out to be positive so I was taken to St Mary’s hospital in Manchester as Blackpool didn’t have the facilities to deal with a 24 week old baby. Needless to say I was nervous but I knew with certainty that my baby would live. God told me in the hospital that the battle belonged to him and the odds were in Joseph’s favour. We decided to choose the name Joseph Hosea as a prophetic declaration. Joseph means to enlarge, increase and prosper and one who is highly favoured. Hosea means to be delivered by The Lord. So I spoke these words out and believed for the best. One night in Manchester hospital, I got angry with God and said to him “I want to go home now. You have said that this baby is fine so I want to go home now and carry my baby full term! I miss Noah terribly and I want to go home!” The Nurse came back with my scan results to say that they could detect slight fluid on the cervix but not enough to be concerned about so I could go home! I praised God for answered prayer and went home to be with Noah after a long week in hospital. This went on for 5 weeks! I was given strict instructions to bed rest and I was not allowed to go home. This was a very difficult time for us as a family. Everything was thrown up in the air! I missed Noah terribly. God kept telling me to stop worrying and to rest in Him. This was a big challenge but I began to let go and feel peaceful. “I am leaving you with a gift—peace of mind and heart. And the peace I give is a gift the world cannot give. So don’t be troubled or afraid.” (John 14:27) Theo and I were stuck in hospital and all we could do was listen to worship music and pray, we found a great peace in this and the song I Can Feel You by Jen Johnson resonated with us both. The scriptures sent to us by church family and friends also held us up. We felt so blessed and loved by so many people during this time. The hardest part was missing Noah and him missing me, I found this heartbreaking and at times just wanted to walk out of the hospital but I knew there was wisdom in staying and all I could hear from God is rest rest rest! I also had a picture during prayer of Joseph held in the amniotic sack but he was not in the world but held in heaven and like in the picture I mentioned earlier he was surrounded by angels and held in an orb of protection; this gave me hope. During these 5 weeks the doctors would come regularly and check how dilated I was. The doctors were perplexed, they said the have never known anyone to be this dilated for such a long time, I told them God was holding my baby inside until the right time. Some doctors agreed! I prayed for my cervix to contract many times but it stayed the same. However, Theo believed Joseph would come early, but at an appointed time when he would be just like any normal healthy newborn. I had trouble believing there would be no problems and I’m so grateful Theo did believe there would be no complications, as Jesus says if we don’t doubt in our hearts, we will see the miracle and we saw the miracle! By week 30, Joseph Hosea came into the world. A tiny and beautiful blessing and he was absolutely fine! The birth was OK, I managed with gas and air and the midwives kept mentioning how peaceful it was in the room, I knew this was the presence of God. When it came to pushing Joseph out it felt impossible but I kept looking into Jesus’ eyes. I had just finished reading Heaven is for Real and the image of Jesus in the story was imprinted on my mind. I just kept looking into his face! It was amazing and I recommend the book if you haven’t already read it! After Joseph was born I haemorrhaged, I lost 50% of my blood and had to have surgery and a blood transfusion. This shook me up and gave me nightmares for a few days. I realised the enemy tried to kill me; but, the amazing thing is, he has no authority to take my life. I refused to let him steal my joy and take my eyes off the victory and salvation of Joseph’s life. 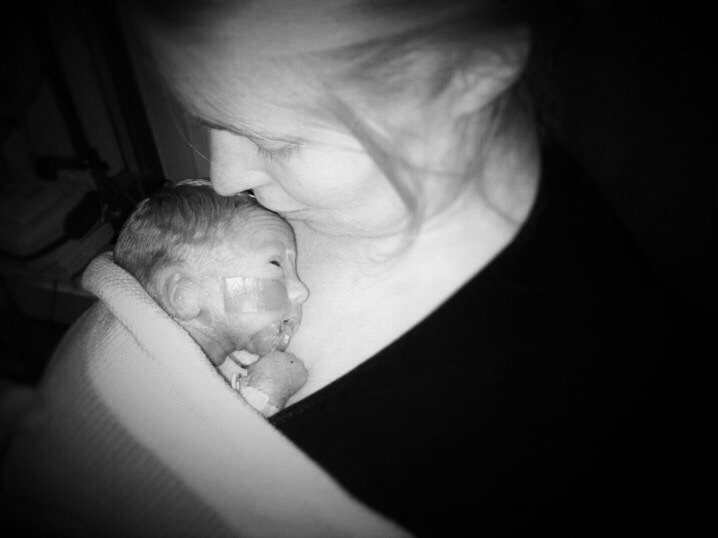 We stayed in hospital for a further 6 weeks and Joseph sailed through with no complications whatsoever. Praise God! To see the favour on our baby boy was and is just incredible. He has been exposed to virus’ and chance of infection both in and out of the hospital and he has miraculously been protected from it all- covered by his feathers, sheltered with his wings…Psalm 91. I’m so blessed to say that Joseph has not been sick throughout the whole experience and this is a beautiful picture of God’s heart for us all. I have learnt that it is God’s heart for us to be well and whole and allow his glory to be seen in us physically. I fully believe that it is through prayer Joseph is alive and well today. The prayers for his life by our friends and family were just so powerful. Our church family held us up and we could feel it. We are so thankful to everyone for their love and help. The love and support was overwhelming and has encouraged us in so many ways. The many, cards, gifts, text messages and facebook messages we received in hospital with encouragement and scripture were powerful. The visits from our close friends, family and pastors were such precious moments and the help we received when I came home from the hospital was so heart-felt. We are truly blessed with an amazing church that cooked and cleaned for us! It’s so vital that we hold onto the truth, ask God to speak to us through his word that is just full of promises and trust in His goodness because God is good, all the time! This is not a cliché but absolute truth. He wants us to be blessed and healed – always! He does not want calamity to come and bad things to happen. It’s simple! Of course bad things do happen because we are in a broken world; subject to futility, and we are at war against dark powers. BUT, praise Jesus, by the power of His blood, when we are armed with his word and it sinks deep into our hearts, we have authority over the enemy and his futile plans.